It�s good to see another brace of performances by Klaus Tennstedt gracing the list of new BBC Legends releases. Here he is with the LPO in core Austro-German symphonic repertoire. 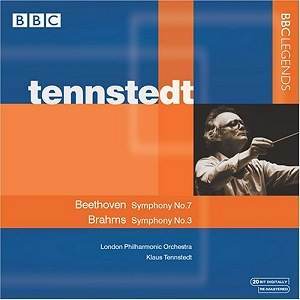 However, as so often is the case with BBC Legends, the value of this issue lies not just in the intrinsic merits of the performances themselves but also in the fact that Tennstedt recorded neither of these works commercially. Indeed, it appears from David Patmore�s useful note that the Brahms symphony was something of a rarity in Tennstedt�s concert schedules. Patmore lists only four performances that Tennstedt is known to have given; a pair in Pittsburgh in 1979 and two in April 1983 with the LPO, of which this was the first. Just as an aside, since these symphonies are both such core repertoire items I wonder if there may have been some less well documented performances of either of them in what was then the Eastern Bloc, prior to Tennstedt moving to the West in 1971? The Beethoven is placed first. This actually comes from a rather special concert, the annual Royal Concert given in London on St. Cecilia�s Day, 22 November, in aid of the Musician�s Benevolent Fund. Tennstedt and his players seem fired by the occasion. The first movement, in which the exposition is not repeated, is full of energy. The music is pushed forward, but not aggressively so, with much rhythmic verve and good use of Beethoven�s dynamic contrasts. The second movement is taken at a pretty steady tempo � but it doesn�t drag; it�s purposeful. I was delighted to note that from bar 19 onwards, when Beethoven drops the dynamic marking from p to pp Tennstedt observes this scrupulously (and on the occasions when the rubric is repeated) to excellent effect. It�s a small point but it�s not always done as well as here. There�s a lively account of the scherzo and then the finale, in which once again the exposition repeat is not taken, is driven along with tremendous exuberance and brio. This is a performance of conviction that sweeps all before it. By and large the LPO plays very well for their chief, though there are one or two very minor fluffs in the horn section. The Brahms is also very well played. The first movement glows warmly but Tennstedt is careful not to permit any autumnal wallowing. Indeed, the development section moves forward purposefully and, as usual with Tennstedt, the orchestral sound is founded on a strongly defined bass line. Though the exposition repeat is omitted, as many conductors do, unfortunately, this is still a strong performance that I found very satisfying. Tennstedt leads a quite serious, searching account of the Andante. He brings out the wistfulness in the music. Indeed it�s arguable that he probes deeper than that and brings out a darker side in the music. The coda is beautifully handled. The third movement is done with affection. The main melody, one of Brahms�s loveliest, is allowed to sing out for all it�s worth. The finale starts with a fine sense of suppressed energy until the more tumultuous music breaks out (at 0:51.). Thereafter Tennstedt imparts a splendid feeling of propulsion, properly controlled excitement and, where appropriate, no little power. But in the more ruminative passages he gives full value too. The radiant coda, one of my favourite passages in all Brahms, is negotiated poetically and nobly. In Michael Steinberg�s felicitous phrase: "We are home ... The garden is softly lit in the glow of sunset." I found this to be a deeply satisfying reading. The sound is very good, allowing us to hear the relationship between Klaus Tennstedt and the LPO at its best. This is an invaluable addition to Tennstedt�s all-too-small discography. I hope BBC Legends will unearth more such performances from this fine conductor. In the meantime this disc will make an excellent Christmas present for a discerning collector.